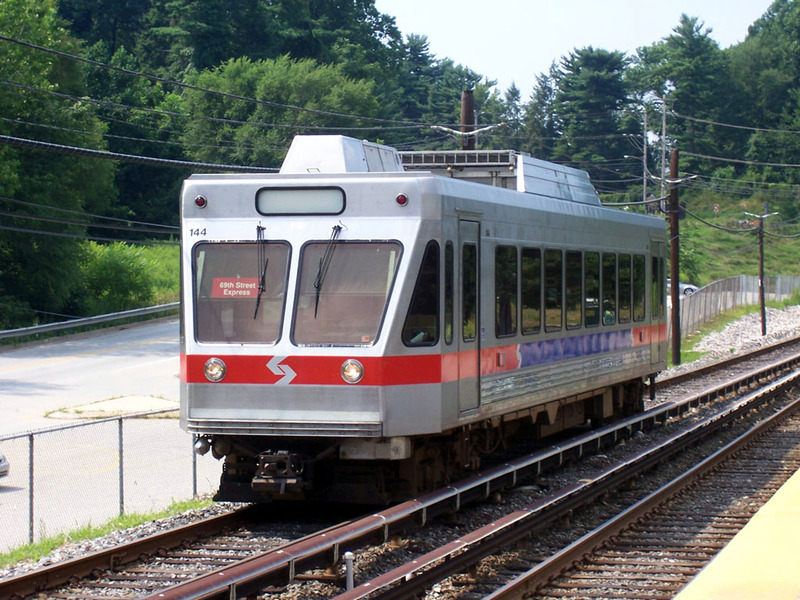 SEPTA’s plan to extend the Norristown High Speed Line to King of Prussia, is moving along reports the Philadelphia Inquirer. The five-mile spur is designed to stop at the mall and the Valley Forge Casino. There are a lot better, cheaper and less disruptive ways of increasing the ridership and utility of the Philadelphia area’s transportation system. Way back when the Philadelphia area’s bus and trolley lines were run by private business, transfers were free. Why? The guys running things understood they would get more riders (and ultimately money) by doing this. They understood that transferring from a busy line to another wasn’t costing them anything as the other had to run anyway and the less the consumer cost the more use the busy line would get. SEPTA now is a tax-funded bureaucracy. Nobody in management is going to lose his job if the bureau doesn’t make a profit. Further there is no incentive to increase ridership. In fact, there is a disincentive as more riders mean more aggravation and the ones running things are going to be paid the same whatever. So the point for the taxpayer is, instead of dumping money into what will be a money losing venture, why not bring back free transfers? Public transportation use might very well increase as much if not more than by building this thing and without the tax hit and construction annoyance. Somebody might point out that SEPTA is pushing for commuters to use monthly passes. Really? How’s it working for them? What percent of the residents of the area use SEPTA on a weekly (or monthly) basis much less have passes? Monthly passes are a good way of using SEPTA, of course, but have you seen any marketing for them? Have you seen the advertisements for them on TV? In any media? Have you seen any marketing for SEPTA anywhere? We haven’t. The private transportation companies used to advertise but not SEPTA. We really don’t believe SEPTA is interested in increasing its riders. Here’s a thought: where is the attempt to synch SEPTA’s rail service with it’s bus/trolley service? How about free transfers for that? It would be cheaper than this rail extension. This project is just a means of getting somebody else to pay for more government-connected jobs. This thing won’t go through Springfield Montco much less Springfield Delco and it won’t be a monorail but we have no problem using the Simpson reference. The cost of SEPTA Free Transfers would be a fraction of what building a five-mile spur along a busy highway. SEPTA Free Transfers might actually cause revenue to increase. 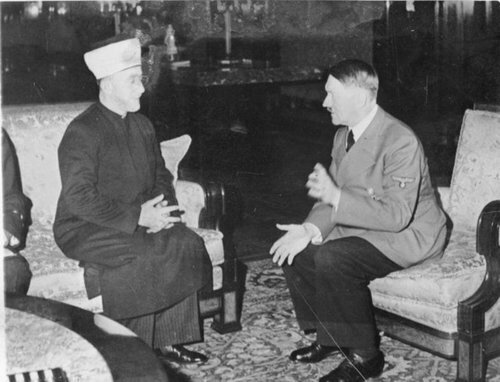 We are not sure if the looming SEPTA ad features this photo of Adolph Hitler with Haj Amin al-Husseini or another. SEPTA had rejected the ad on the grounds it violated “minimal civility standards”. SEPTA says it is considering an appeal. The ads are produced by the American Freedom Defense Initiative, a New Hampshire-based group that opposes U.S. aid to Islamic countries and has filed similar lawsuits in New York and other cities. Judge Goldberg noted that SEPTA has run viewpoint ads on public issues including animal cruelty, birth control, religion and fracking. Look for it on a trolley or bus or El train near you. This spruce tree on the North Rolling Road “Rock Island” traffic island in Springfield Pa is ready to fall like three of its sisters have already done. Several large trees are dead or nearly so in the unit block of North Rolling Road in Springfield Pa in Delaware County. One is a spruce tree on a township-owned traffic island at the northern tip of Windsor Circle. 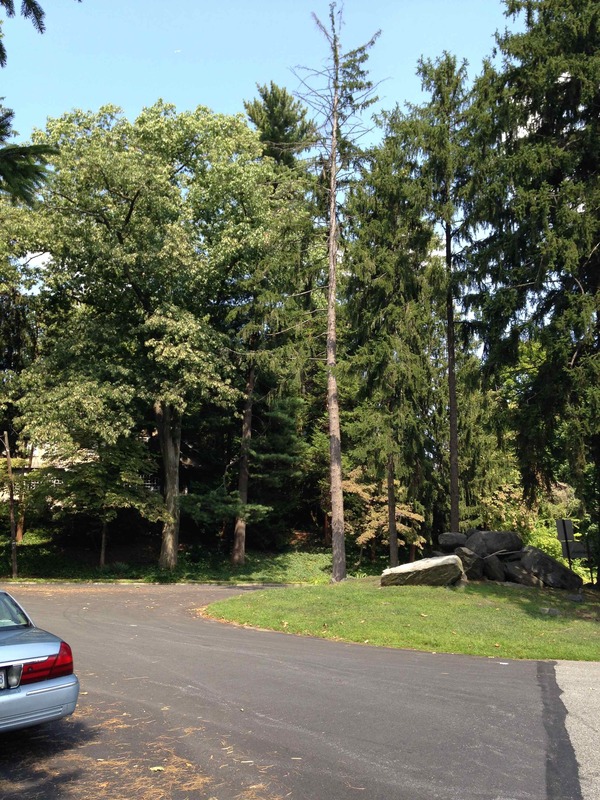 Two are oak trees on SEPTA land bordering the Route 101 Trolley Line. It would be a lot wiser for the trees to be removed now before they crush a car (or pedestrian) or simply fall and block the well-traveled road for a day. Three of the spruces have already fallen from the traffic island damaging private property. 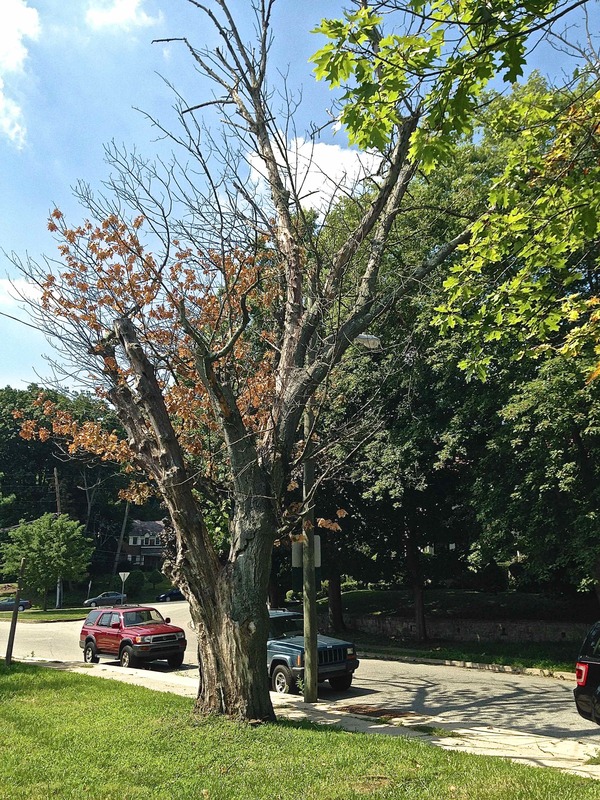 This dead and dangerous oak tree on the SEPTA land on North Rolling Road, Springfield has been known to block the sidewalk with its fallen limbs. 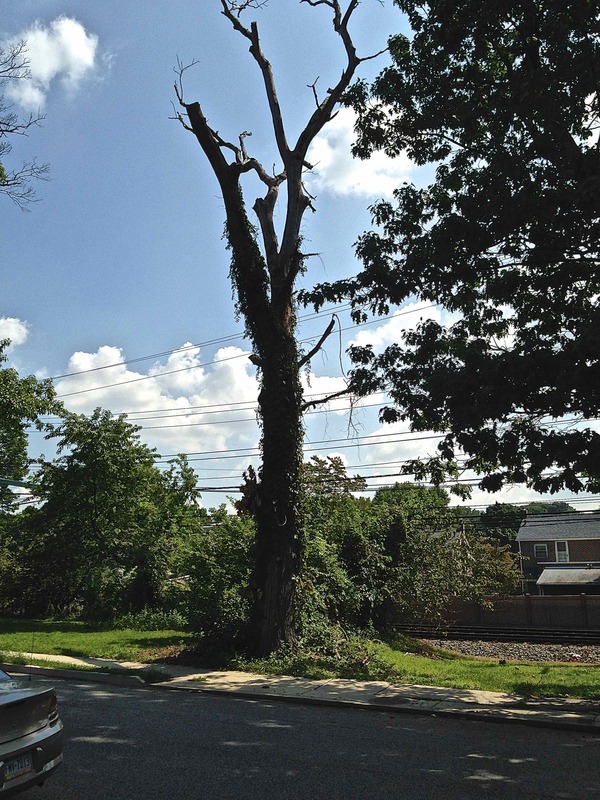 Another dead or near-dead tree on the SEPTA land. What would the township do if these were on private residences? Going underground on the El. Today’s observation regarding logic and SEPTA concerns the bus lanes on Market Street in Philadelphia. You are motoring at a snails pace down Market Street east of City Hall and you find yourself wondering why the right lane is reserved for buses. 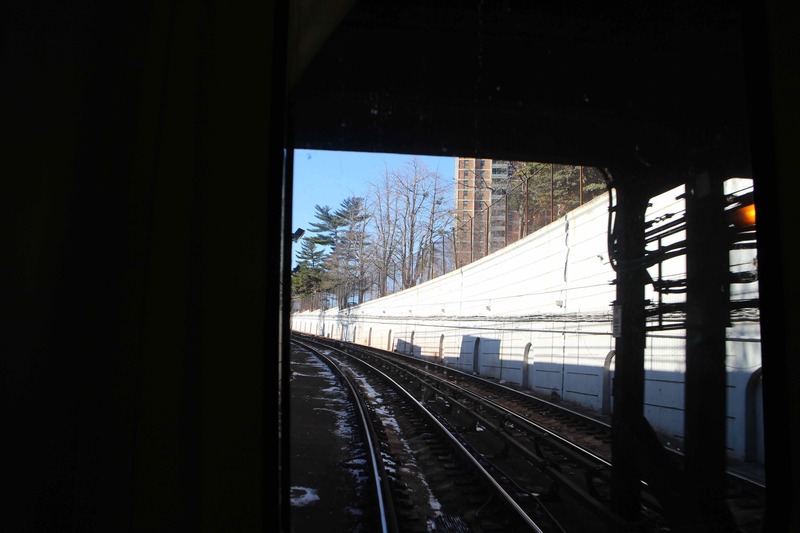 The subway/el runs the entire length of the street. Pull the buses off of Market Street and maybe SEPTA would not have been able to cut those routes nobody was using anyway so Tom Corbett and the rest of the other-people’s-money spenders in Harrisburg would give them a half billion. 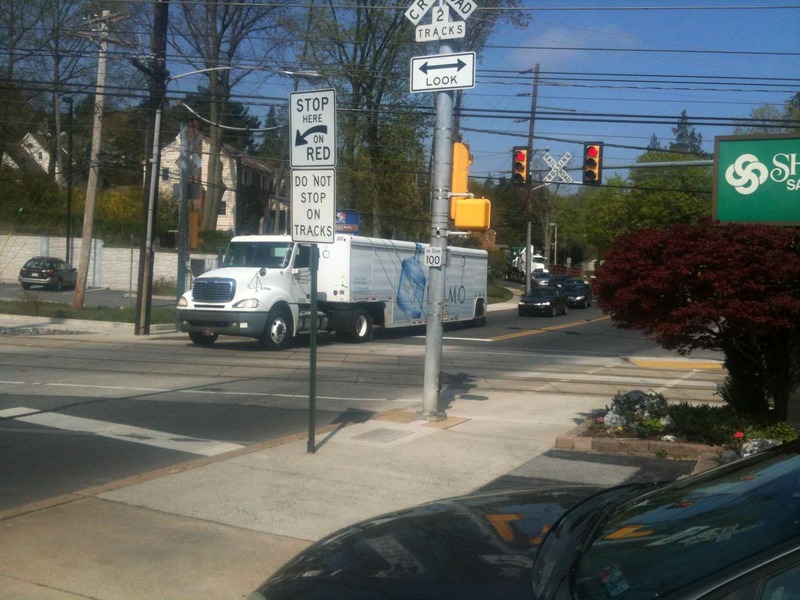 SEPTA Traffic Snarls In Springfield — Work on SEPTA’s Route 101 trolley line caused stop lights to turn steady red on Springfield Road in Springfield this morning, April 24, 2013, leading motorists to make their own traffic rules until police arrived to provide some order. The photo was taken at 10:12 a.m. Police arrived on the scene about 10 minutes later. It’s the second day of the return to service for SEPTA’s Route 101 and Route 102 trolleys although one might suspect that many of those who live along the routes might not be aware of it. The new continuous-weld tracks are that quiet. One important caveat. If you should happen to be a teenager using the tracks as a hiking trail to school or wherever, you may want to change your habit. The trolleys are really that quiet. The months-long, $34 million renovation project of the SEPTA 101 and 102 trolley lines in Delaware County, Pa. ends Monday and service resumes. The new continuous-weld rails should make the trips much smoother for passengers and, hopefully, quieter for residents near the tracks. One engineer has informed us that no major work should be required on the lines for at least a half-century. And kudos to the drivers of the replacement buses who have gotten high marks from those having to use them. The feds, since 1991, have had a plan of creating high speed rail corridors throughout the nation including one between Pittsburgh and Philadelphia and since Obama took office $8 billion has been shoved into this opium-pipe dream with billions more expected although that hope may change come November. Texas and the Sourth outside Florida haven’t gotten much of this loot for some strange reason albeit Pennsylvania’s not much ahead nabbing a paltry $25.6 million for the Keystone Corridor project. Grand schemes like this would be great if resources were infinite and the simple building of it was the hardest and most expensive part. The real problems, however, start after the tracks are laid and the shiny new stations open, namely getting people to use it. Remember these things are being built not with the jaundiced eye of someone weighing the risks to his own time and money against the benefits of possible future rewards, but in accordance with starry visions of bureaucrats and trained academic parrots who have literally nothing to lose in the construction. So the only way people are going to use this thing is by discouraging them — them not including the bureaucrats and parrots — from using alternatives namely the planes and automobile parts of the story. Hmmmm, you think that might happen? A much better way of improving transportation efficiency would be to use that money for our highways. That $8 billion could turn a whole lot of turnpikes into freeways eliminating artificial traffic bottlenecks and general headaches. Or if construction is what one desires, there are plenty of places where the money could be used to improve traffic flow cutting commuter time and saving gasoline. Consider Route 322 in Delaware County, Pa. Coming north from I-95 it hits Route 1 in Concord, follows that road south for a couple of miles until it reaches Route 202 at a massive bottleneck of an intersection where it then follows 202 north into Chester County before getting exclusive use of blacktop. What if the some of the money Obama wants to use on choo choos was spent sending Route 322 directly into Route 202 with a cloverleaf at Route 1. If the money was properly used those whose land would be needed for the project would have big smiles on their faces after negotiations for it, and dollars to donuts say more time and gas would be saved than a bullet train to Pittsburgh. And situations like this can be found throughout the nation. But cars mean freedom whereas trains mean control. And this does not mean that trains are bad or that passenger trains don’t have their purpose. Something else to ponder — America’s freight railroads are owned and operated by private companies. In Europe, they are owned and operated by government. In the 1950s, the percent of freight shipped was about the same. Today, about 38 percent of freight is shipped on railroads in the U.S. compared to 8 percent in the European Union. Maybe to make passenger trains viable again, we should get the government out of Amtrak. SEPTA’s fare hike took effect today with the the price of a token rising ten cents to$1.55; a weekly transit pass jumping from $20.75 to$22; and transfers for subway, bus and trolleys being hiked 25 centsto $1. Also off-peak discounts were ended for regional rail. Base fares on buses, subways and trolleys remain $2. Meanwhile it has been revealed that SEPTA officials have been enjoying thousand-dollar company lunches at places like Fountain Restaurant at the Four Seasons Hotel in Center City. The trolley and bus drivers are generally pretty decent people who work honest hours for what they get but has it occurred to anyone else that management has no real incentive to grow the largely tax-funded authority. In fact, it seems, that if ridership were to significantly increase they would, well, have to work harder, and why would they want to do that if they are taking lunches at swank restaurants now? They are clearly not trying to grow. How much marketing do you see for SEPTA? Maybe a rewritten press release in the dino media but not much. If you should have moved into the area, did you ever get a direct-mail piece describing what SEPTA could do for you and how to use the system and get discounts? Maybe free passes to sample the service? More riders would mean more people to deal with which would mean more headaches. It’s much easier to be able to leave the cell phone off at catered affairs.